Another classic episode from Tom Baker's much-loved stint as Doctor Who. The planet Karn is home to a mystic black-robed Sisterhood, whose sacred flame produces an elixir of life. But it's also home to Solon, a fanatical scientist who is using the remnants of spaceship crash victims to put together a new body for the still-living brain of the executed Time Lord criminal Morbius. 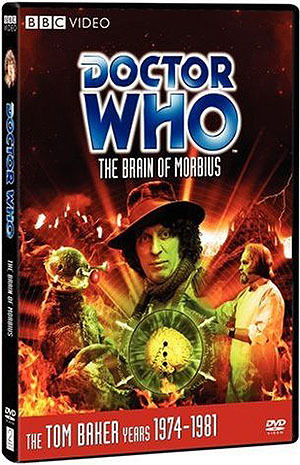 When the Doctor and Sarah Jane Smith (Elisabeth Sladen) arrive on the planet, Solon decides that the Doctor's head might just be what he needs to complete his dastardly work. Commentary with actors Tom Baker, Elisabeth Sladen and Philip Madoc, director Christopher Barry and producer Philip Hinchcliffe. Designs on Karn (dur. 6' 08"): designer Barry Newbery talks about his work realising an alien planet in a Gothic style. Set Tour (dur. 2' 10"): unique look inside the TV studio in the form of a 3D CGI tour of TC1 at Television Centre, showing how the various sets were constructed and arranged. The Sketch Gallery (dur. 2' 22): original design sketches plus new concept artwork used in the DVD features. Also included: Photo Gallery, Coming Soon trailer, Radio Times Billings PDF, Program subtitles and Subtitle Production Notes, Easter Eggs.